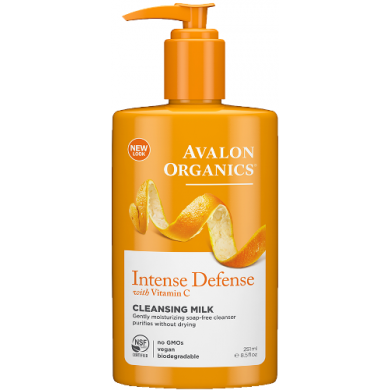 Avalon Organics Intense Defense Cleansing Milk with Vitamin C is a gentle soap-free face wash that nourishes skin and provides Photo-Aging Defence. This cleanser is enriched with plant-derived antioxidant-rich Vitamin C as well as Lemon Bioflavonoids and White Tea. These natural extracts help to soothe oxidative damage and to fight the visible signs of photo-aging for smooth, radiant complexion. How to use: Add a small amount of cleanser to dampened palm and gently massage over face and neck. Rinse well. 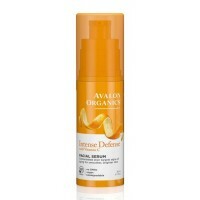 For best results, follow with Avalon Organics Vitamin C Renewal toner and moisturizer. 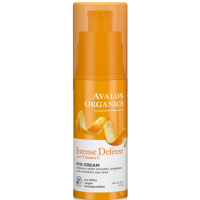 Avalon Organics Vitamin C Renewal skin care products are formulated with a powerful form of Vitamin C that helps to prevent free radical damage. This natural skincare collection helps to stimulate skin cell regeneration as well as to increase collagen production and improve skin elasticity. Ingredients Aloe Barbadensis Leaf Juice(1), Aqua (Water), Stearic Acid, Glycerin, Glyceryl Stearate SE, Cetearyl Alcohol, Cetyl Alcohol, Helianthus Annuus (Sunflower) Seed Oil(1), Caprylic/Capric Triglyceride, Aleurites Moluccana Seed Oil, Borago Officinalis Seed Oil(1), Butyrospermum Parkii (Shea) Butter(1), Citrus Aurantium Bergamia (Bergamot) Fruit Oil, Citrus Aurantium Dulcis (Orange) Peel Oil, Citrus Limon (Lemon) Peel Oil, Arnica Montana Flower Extract(1), Camellia Sinensis Leaf Extract (White Tea)(1), Chamomilla Recutita (Matricaria) Flower Extract(1), Citrus Limon (Lemon) Peel Extract (Lemon Bioflavonoids), Laminaria Digitata Extract(1), Lavandula Angustifolia (Lavender) Flower/Leaf/Stem Extract(1), Linum Usitatissimum (Linseed) Seed Extract(1), Olea Europaea (Olive) Leaf Extract((1), Ascorbic Acid, Ascorbyl Glucoside, Cetearyl Glucoside, Tocopheryl Acetate, Xanthan Gum, Alcohol(1), Benzyl Alcohol, Potassium Hydroxide, Potassium Sorbate, Sodium Benzoate, Limonene. (1)Certified Organic Ingredient. 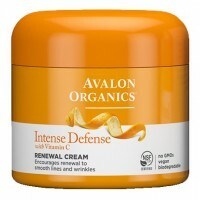 Avalon Organics Intense Defense Eye Cream with Vitamin C is an antioxidant-intensive eye cream ..